Some cells at particular stages contain large nuclei with giant or large sized chromosomes. The giant chromosomes are the Polytene and Lamp brush chromosomes. An Italian cytologist E. G. Balbiani (1881) has observed peculiar structures in the nuclei of salivary glands of Chironomous. Later, T. Painter and co-workers observed the same type of structures in the salivary gland of Drosophila and recognized them as chromosomes. 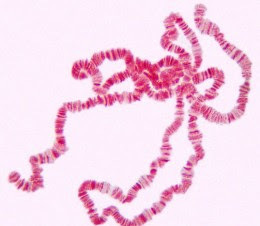 These chromosomes are characterized by big size swelling and cross striations.Because they were observed first in salivary glands they were called salivary gland chromosomes. Maternal and paternal homologous chromosomes remain associated side by side in polytene chromosome. This phenomenon is called somatic pairing.ThusDrosophila has only four polytene chromosomes. RNA synthesis occurs in many of the bands of the chromosome. When this occurs, the tightly packed chromatin threads in a band unravel and bulge out forming a puff. 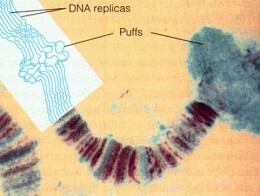 Puffing is the results of loosening of the chromatin. Puffed bands are sites of particularly intense RNA synthesis. Particularly large puffs are called Balbiani rings.